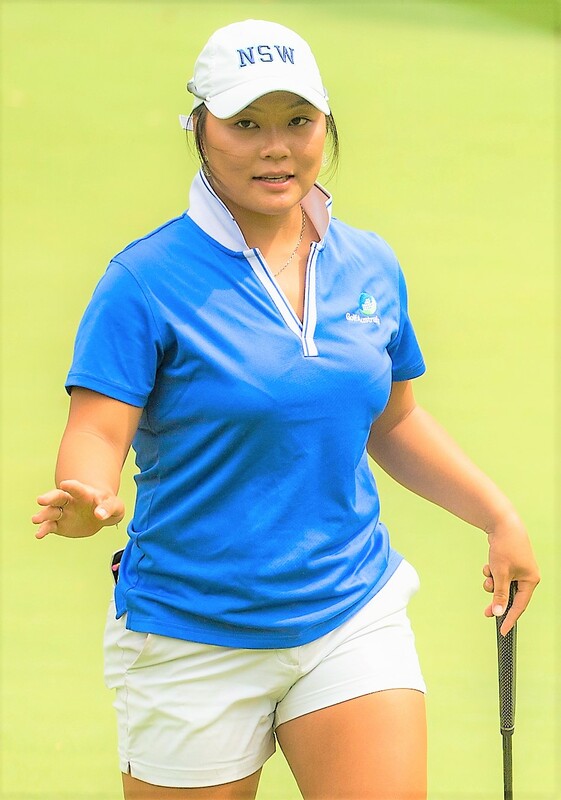 Rising New South Wales amateur star Doey Choi, pictured, holds a two-stroke lead after the opening round of the Pacific Bay Resort Australian Ladies Classic – Bonville. Choi, the reigning Queensland and South Australian women’s amateur champion, fired a brilliant six-under-par 66 to sit two shots clear of Swedish duo Madelene Sagstrom and Daniela Holmqvist at Bonville Golf Resort in Coffs Harbour. Another Swede, Jenny Haglund, shares fourth with western Australians Hannah Green and Whitney Hillier who played during a morning of light rain. They were later joined by Nuria Iturrios from Spain, who shot a bogey-free 69 in hot and humid conditions. Choi, 18, from Concord Golf Club in Sydney, reeled off an impressive eight birdies against two bogeys in her first round. She made six birdies against a solitary bogey in her first 11 holes, with her only blemish on the difficult 17th played over water, where she failed to get up and down from over the green. She bounced back immediately with back-to-back birdies, sinking a solid putt on the long 18th followed by a chip-in on the par-4 first and made further gains at the fifth and sixth holes before dropping a second shot on her penultimate hole, the par-5 seventh. Choi was pleased with her best ever 18-hole score, as she had a tough time at the Australian Open in Adelaide last week. Tied for the lead with Karrie Webb on three-under-par after nine holes, she dropped four strokes over the back nine for an opening 73 and followed up with an 80 to miss the cut by seven shots. “I didn’t play too good last week so confidence wasn’t too high. I haven’t been hitting it that great, so it was nice to play some solid golf today,” said Choi. She added that she has enjoyed playing golf at Bonville since she was a junior. Sagstrom, the halfway co-leader at the Australian Open last week, also made a solid start in the challenging weather conditions. “It was very much rain on, rain off. We can’t control the weather, so we stayed patient and did what we were supposed to and made really clear decisions,” said the European Solheim Cup player, who mixed six birdies with two bogeys on her debut at Bonville. Holmqvist, who finished fourth in the tournament last year, was back in the mix after a flawless round containing four birdies. She said: “I shot four-under-par with 31 putts, so my ball striking was pretty good. I hit 17 greens today, reached two par 5s in two and overall it was a comfortable day. I wish I had made more putts, but don’t we all. I was a good day and I love this course. I think it’s beautiful and a great track. Earlier in the day, Green made a flying start with consecutive birdies on her first two holes, the ninth and the 10th and she moved to three-under with a birdie on the long 14th. She dropped shots on 16 and 17, but quickly recovered with birdies on the fourth and the seventh. Green said: “It was a bit up and down. I had a couple of bogeys out there due to 3-putting, but then I also holed some really good putts as well. Overall I’m happy with how I struck the ball today and I hit a lot of greens, which put me in the position to have some birdie putts. Hopefully I can continue that momentum throughout the week. “The course held up really well with the rain, so you didn’t have to worry about any water puddles. The course is really good and the greens are really nice. Hillier also had a topsy turvy round, highlighted by an eagle on the par-4 sixth, where she holed her second shot from 118 metres using a 9-iron. The forecast is for sporadic showers all week, and while that might prove tricky for the players, it will be a source of pleasure for the locals after a lengthy dry spell in recent weeks.